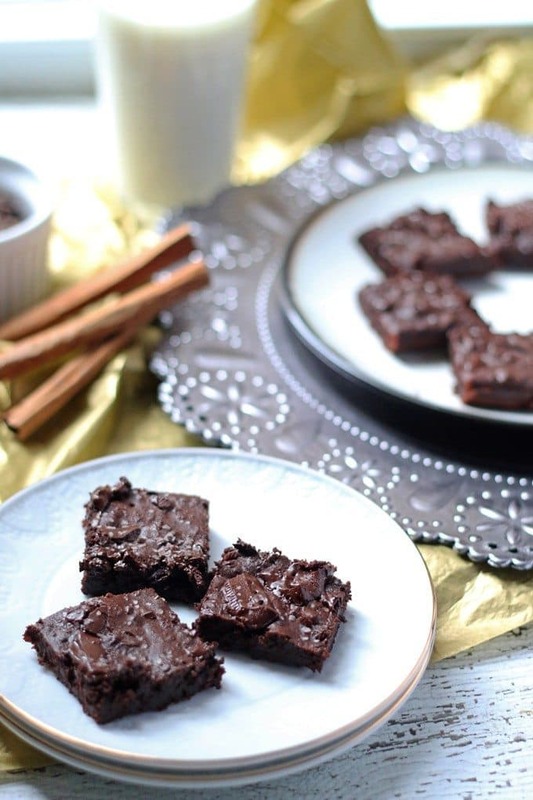 These salted Mexican chocolate black bean brownies are perfect for New Year’s Eve celebrations! Made with Born Sweet® Zing™ Baking Blend, they will be a delicious slimmed down addition to your holiday party! New Year’s Eve is here and I have a delicious holiday treat for your celebrations. 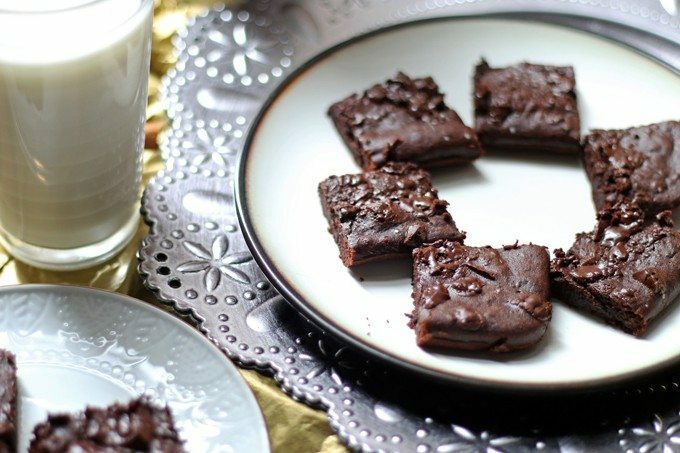 These salted Mexican chocolate black bean brownies are the perfect lower calorie treat for you to bring to your New Year’s Eve parties and a great way to start your resolutions a day early. An added bonus – mix up everything in the blender to minimize your dirty dishes! The first time I made black bean brownies I was a little nervous. Black beans and baked goods? Sounds weird but let me tell you, I was so pleasantly surprised to find that I LOVED them. Black beans have always been a favorite and they are now my go-to secret brownie ingredient. 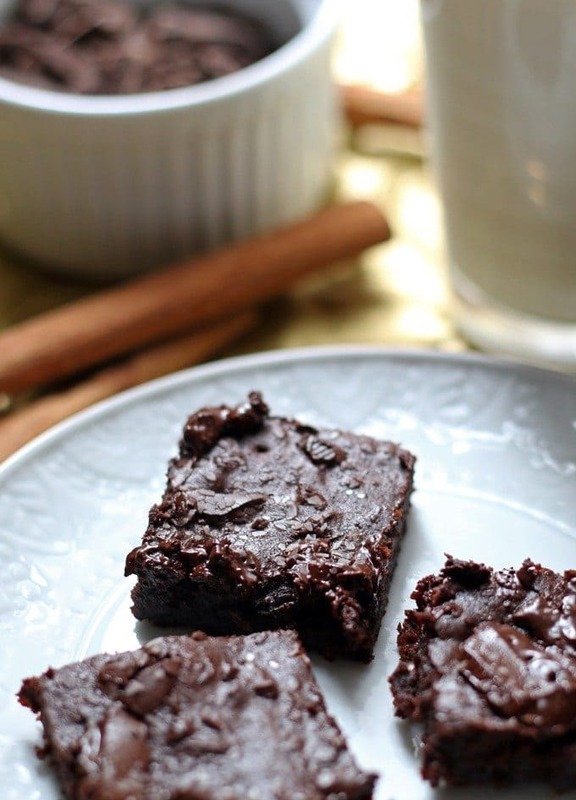 I slimmed down my favorite black bean brownie recipe by using Zing™ Baking Blend. Zing™ Baking Blend is made with stevia leaf extract and pure cane sugar. 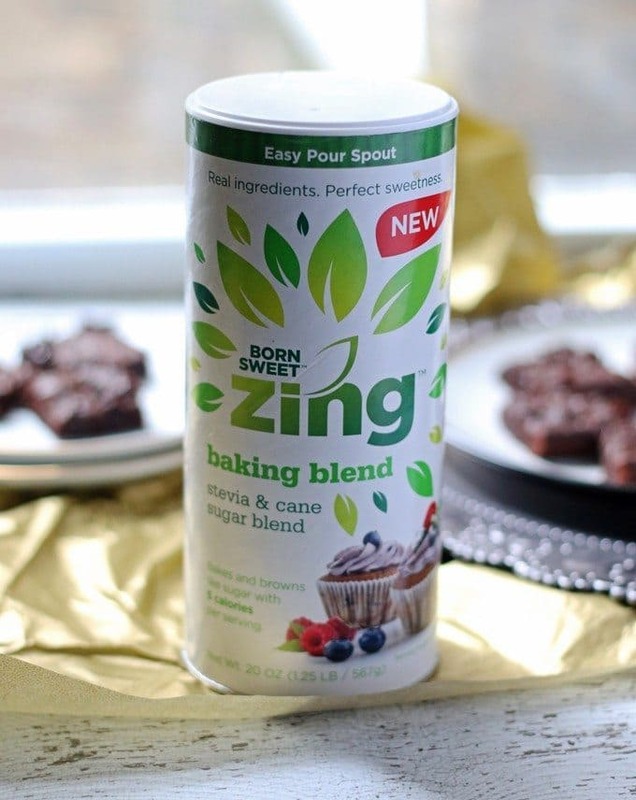 If your New Year’s Resolution is to count calories, switch to Zing™ Baking Blend – it has only 5 calories per serving! As an added bonus, Zing™ Stevia Sweetener products are made with only real ingredients! Get ahead of the resolution game by celebrating with this fun treat. If you want to sweeten your recipes in the New Year with fewer calories, be sure to visit the Zing™ website to find Zing™ Baking Blend in a store near you! 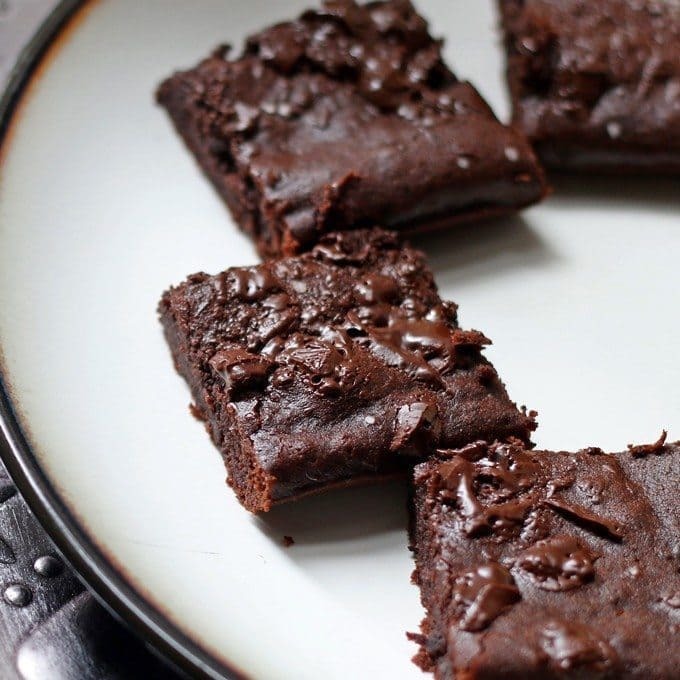 To make these brownies, you will need a blender and a shallow baking dish. Puree the black beans and oil in your blender first and then add the remaining ingredients. Pour the black bean mixture into a prepared baking dish and sprinkle the chopped chocolate on top. I usually chop up a chocolate baking bar but you could use chocolate chips instead. Place the dish in the oven and bake the brownies until the brownies come away from the side of the pan. Remove it from the oven and let cool completely before cutting. Preheat oven to 350 degrees F. Spray a shallow baking dish with non-stick cooking spray and set aside. In a blender, puree the black beans and olive oil until smooth. Add the Zing™ Baking Blend, cocoa powder, eggs, vanilla extract, cinnamon and cayenne pepper to the black bean mixture and pulse until just combined. If needed, scrape the sides of the blender with a spatula to ensure all ingredients are well mixed. Pour the mixture into the prepared pan and use a spatula to even out the mixture. Evenly sprinkle the chocolate pieces on top of the mixture, followed by the kosher salt. 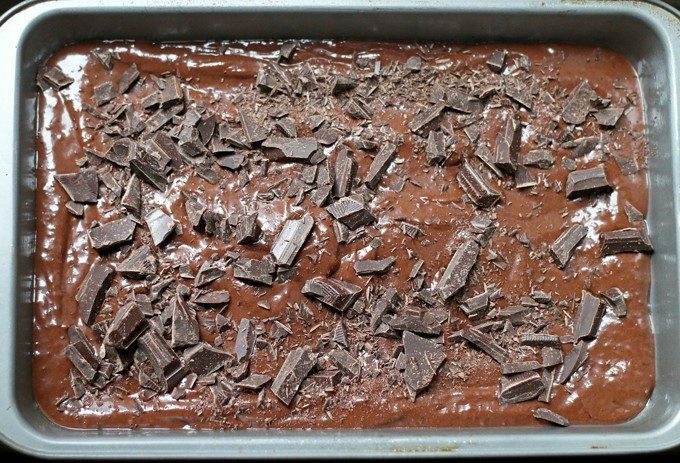 Place in oven and bake for 20-25 minutes, or until the brownie edges come away from the sides of the pan. Remove from oven and allow to cool completely before cutting. Recipe modified from Zing website. YES! Salted Caramel and Chocolate are my favorites! I’ve never made black bean brownies. These look so crazy good – I NEED to make them! What an awesome way to start the new year on the right foot. These look delicious! 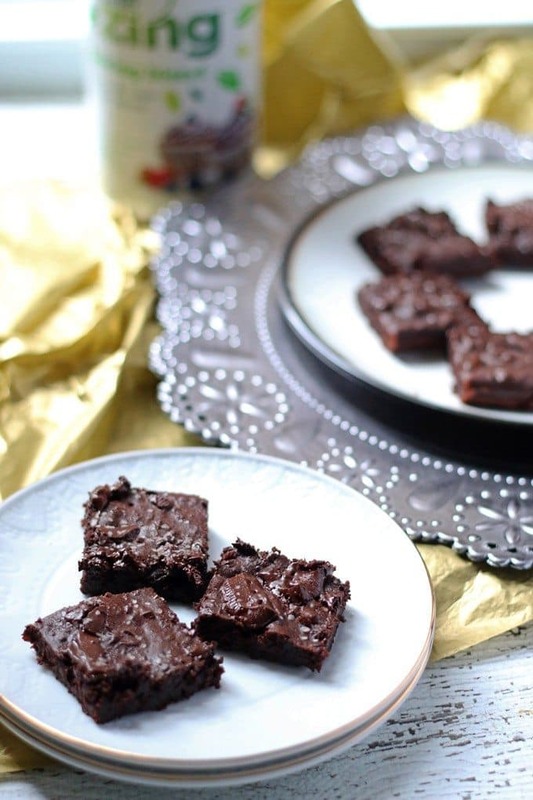 I’ve never tried black bean brownies but I’ve heard so much about them! These look perfect. I like the idea of using Zing! Great for the new year. Your brownies look superb, I wish I had some to nosh on! I adore black bean brownies (and was so surprised the first time I tasted them). Love the salted touch! I’ve been wanting to try black bean brownies. Definitely going to have to see if I can sneak this healthy substitute by my family. These definitely need to go on my must-try list. I wonder if the kids will know the difference? I doubt they would notice – they just seem super fudgey! Oh yum! I’ve had black bean brownies before and I really enjoyed them! I love the added ingredients. They look and sound amazing! Definitely trying them. Thanks so much for linking up with us over at #BestOfTheBlogosphere! My sister-in-law is the queen “bean brownies”! I can’t wait to show her your recipe 🙂 Oh, I hope she shares!! Oh my gosh, these look so good! /just look at the chocolate chunks. I think it’s perfect for this time of year, too, what with resolutions and all! Thanks so much for linking up to Throwback Thursday and hope to see you there next week, too!